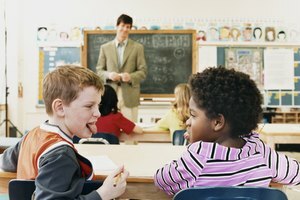 Misbehavior causes disturbances in the classroom and makes it difficult for students to enjoy the educational process. Dr. Rudolf Dreikurs, an educator and psychiatrist, came up with a theory that claimed all students who misbehaved did so for self-serving purposes. This theory listed four possible motives for misbehavior. In addition to these causes, there are other factors to consider that may result in a student who refuses to act appropriately. Being the center of attention is a common desire for students, some more than others. According to Dreikurs, 90 percent of all misbehavior is done to get attention. Being the center of attention is a common desire for students, some more than others. Acting out by making fun of others, swearing, talking out of turn or simply being uncooperative are a few ways students looking for more of the spotlight may misbehave. Signs of a power-seeking student include constant arguing and a refusal to follow basic rules intended for everyone. Some students who misbehave are expressing a desire for more control in the classroom, and acting inappropriately makes them feel powerful. These students are not content to go along with the general plan and make it known they want things their way. Signs of a power-seeking student include constant arguing and a refusal to follow basic rules intended for everyone. Some children lash out in the classroom as a response to hurt feelings they experience. By misbehaving, they feel they are getting back at those responsible, whether it involves the students, the teacher or both. Students who misbehave as a motive for revenge may enjoy acting cruelly or even violently towards others. Revenge seekers are likely to perform bullying acts, such as shoving and excessive teasing. A general fear of failure occurs when a student feels he cannot possibly live up to any expectations. These students misbehave as a way to avoid participating in anything that may lead to failure. Although the child may seem completely confident with school-related activities outside of the classroom, he acts incapable of functioning in a learning environment. Students who are misbehaving may have some kind of temporary malady contributing to their attitude. Students who are misbehaving may have some kind of temporary malady contributing to their attitude. For instance, a child who is overly tired, sick, hungry or simply the victim of a sudden change in routine may demonstrate troubling classroom behavior. Poor seating arrangements may result in behavior issues. 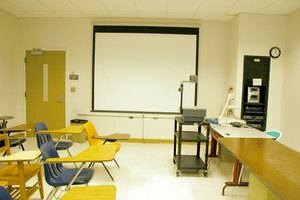 A classroom not designed for optimal learning may contribute to a student who refuses to behave. Poor seating arrangements, extreme temperatures or a high noise level are all distracting elements in a classroom that ultimately hinder the learning experience. The atmosphere in classrooms like these will result in behavior issues. Some students may not feel challenged enough to behave properly. Some students may not feel challenged enough to behave properly. If the information taught is not appropriate for the learning abilities of an individual, she may mentally withdraw out of boredom or frustration, resulting in behavior problems. Additionally, a particular teacher's instruction style may cause conflicts with a student, disrupting the learning process. Hendricks, Spencer. "What Are the Causes of Misbehavior in the Classroom?" Synonym, https://classroom.synonym.com/causes-misbehavior-classroom-7804631.html. Accessed 25 April 2019.